Buying presents at holiday time can be a difficult task, especially if the individual the gift is for is someone that one does not know much about. The solution to this problem is simple and easy to fix. Gift certificates are the perfect way to allow the recipient to choose what they like best. Using a customized holiday gift certificate template can also let the giver to design the certificate and add a personal touch. First and foremost, when wanting to use the holiday gift certificate template is to access the template. Once the application has been accessed, the individual will need to design their template to meet their unique wants and needs for their business. There are many different designs that can be chosen from, as well as unique fonts. Once the template is fully designed, the next step will be to enter the business information to the holiday gift certificate template. The individual will then need to determine the amounts to be shown on the certificates, or whether these will be filled in by hand at a later time. There is a good chance that the recipient of the gift certificate will not be entirely familiar with the business. For this reason including specific information, like a product or service offered will be of great service. The gift certificate template is also the perfect way to thank the customer for purchasing the item. Including a thank you for their patronage, or even a holiday greeting is a perfect way to show the consumer how much their patronage is appreciated. Since the template is easy to customize, there will be ample chance to make it unique to your business needs. The ease of use of the template also makes it simple to download and save for future reference. The best part is that the template is free for use. Simply visit this website and one is good to go. 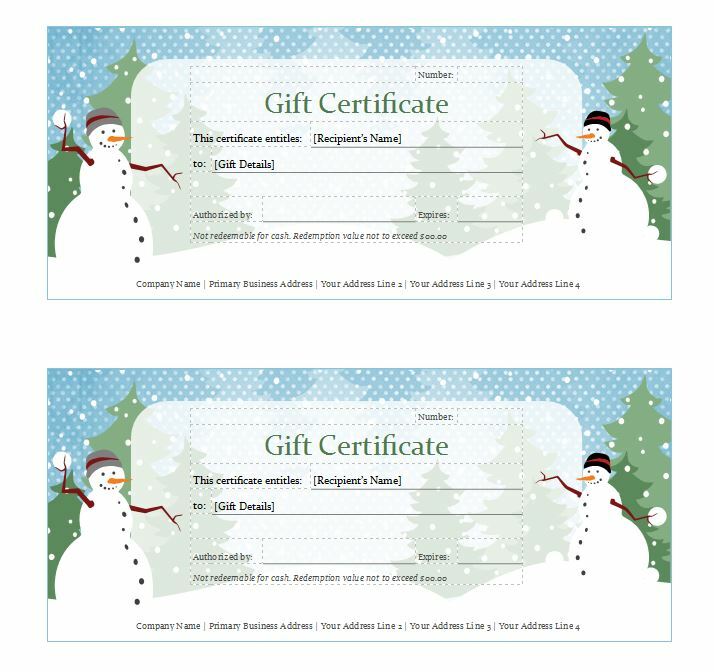 Using a holiday gift certificate template makes one aspect of holiday gifting easier for the consumer, and for the business. The consumer will be able to offer the freedom of choice for the recipient of the certificate, making it the perfect gift. The business will able to project future sales, and be able to enhance their customer base through new customer sales from the certificates.